Our mission is to preserve, conserve and restore native plants and native plant communities of Florida. Coccoloba Chapter hosts monthly member meetings with informative speakers. These meetings are open to the public and generally advertised. Top-notch speakers provide information to members and the public to fulfill our mission. Coccoloba Chapter participates in classes to educate the public of the benefits of native plants and, on the other hand, the need to remove invasive exotic plants. WETPLAN (Stormwater Ponds Management) classes are held around Lee County. Other classes available are: Landscaping Naturally and DIRTy Science. Coccoloba Chapter manages a native plant nursery in a private area of Koreshan State Historic Site. They promote and sell native plants EVERY SUNDAY at the Koreshan Farmers Market and Native Plant Sale. They also provide concierge service to make sure each customer has the native plants they want. These special orders have grown in popularity. Additionally, they are monitoring an endangered native milkweed at Koreshan. Asclepias curtissii was discovered on the property and volunteers are hoping to learn propagation techniques to increase this important food for monarch butterflies. In Estero Bay Preserve, Coccoloba volunteers monitor a population of Asclepias feayi. Although not listed as endangered, many consider this plant even more rare than A. curtissii. Finally, Coccoloba volunteers monitor and treat Tillandsia utriculata and T. fasciculata. They propagate these air plants to assure a population survives the invasive exotic weevil decimating the population. Coccoloba volunteers are always working on plantings around the park including propagating some of the park's rare plants for additional areas on the property. Coccoloba Chapter also makes native plants available at all possible events. For instance, members bring propagated plants from their yards to monthly meetings. These plants are described and auctioned off during the meeting. Coccoloba Chapter provides other support to schools by hosting teachers' workshops and conducting site visits. The chapter also monitors and assists with previous planting projects like at Fort Myers Middle Academy. Speaking of site visits, Coccoloba Chapter conducts site visits to homeowners' properties providing hands-on assistance to meet their native plant goals. Coccoloba Chapter coordinates field trips that are generally open to the public to see native plants in their natural environment. Coccoloba Chapter members also participate in land management reviews of public lands to evaluate how the land is being managed. These reviews are in conjunction with various like-minded partners such as Department of Environmental Protection, Florida Forest Service, Fish and Wildlife Conservation Commission and others. Coccoloba Chapter hosts workdays at various publicly-owned properties to pull weeds and spruce up the natural space. This hands-on activity helps us learn what to pull out and what to keep, while providing a little extra assistance to the park. 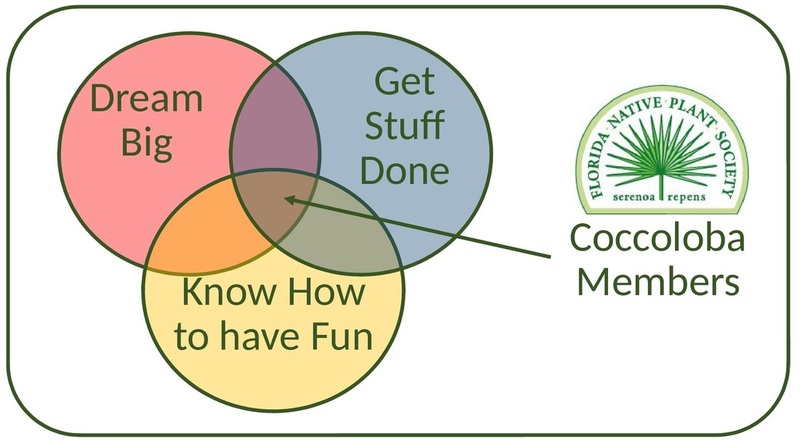 The bottom line is that Coccoloba Chapter and their fantastic members work well with others and successfully get more native plants in the ground! Every single Sunday from 8-1, volunteers man our booth promoting native plants at Koreshan State Historic Site. We explain the benefits of native plants along with the appropriate fertilizer ordinances. We make native plants readily available for purchase. We are always buying plants from native plant nurseries. We always need help picking up plants and delivering them back to the nursery. We maintain the cultivated native plantings around the park. We always need help watering plants and pots and adding new plants to the gardens. Volunteers are always stepping up potted plants or starting plants from seed. We propagate by cuttings and other techniques, too. We also monitor and protect endangered and rare native plants on the property.